There are so many occasions where poetry would be the perfect gift to give. Now you can make a complete gift by combining your poem with one of our designs that fit in the double attached 4x6 inch silver frames. If you have a long poem please see some of our designs in other frames that will accommodate a lengthy verse. There is no need to send us a photo. 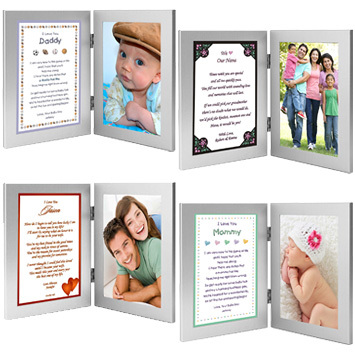 You or the gift recipient can easily add a 4x6 inch photo after the Poetry Gift arrives. The back of the frame is easily opened to inser the photograph. You have the option of including a photo before you give the person the gift or the person receiving the gift can easily add their photo. When you plan to send the Poetry Gift directly to someone and you have a photo you would like displayed in the frame, we can insert your photo if you e-mail a photo attachment to us at photo@poetrygifts.com after you place your order. Please let us know that you are emailing us your photo when you place your order by typing that information in the "Comment" section of the order form after you enter your email address. 4. Closing Phrase and Your Name(s) (as seen after poem) - (Examples: With Love, Michael; All My Love, Michelle; Love You Always, Mom & Dad; etc." Please look at the design in order to determine a suitable poem length. There are no set guidelines; but the longer your poem, the smaller the type. If your poem is much longer than the length you see in the photos of your chosen design, the font/type will need to be made smaller to accommodate your entire poem. On the order form, please make sure to type an email address that you check often and phone number in case the designer needs to reach you with any questions. I received the framed poem yesterday, sooner than I had expected. It is beautiful. I know my daughter will love it. It's been a pleasure doing business with you. I will tell my friends about you. Thank you! Thank you very much. Great result. Very pleased with product and speed of delivery.